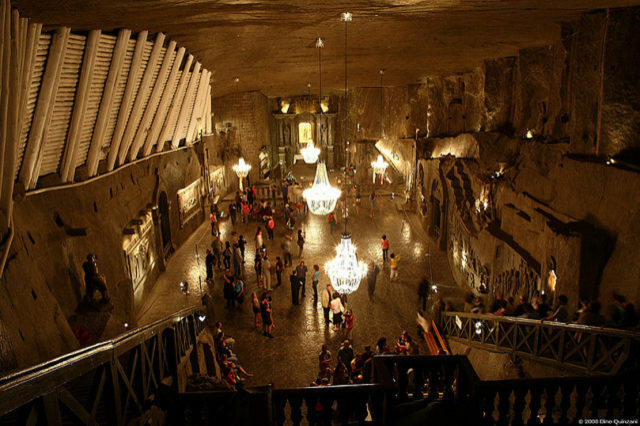 Few underground cities in the world are sculpted entirely out of rock salt. 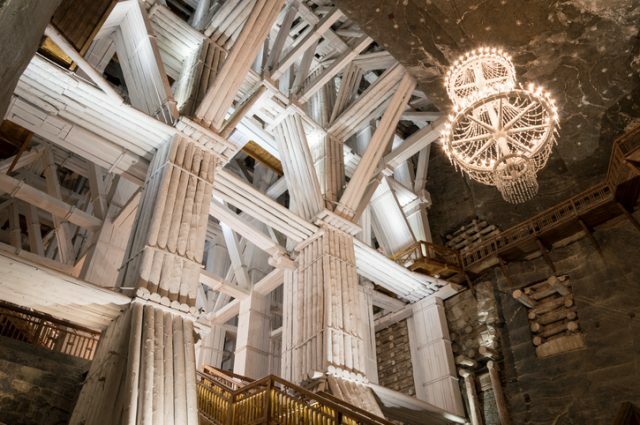 That’s the magic of Poland’s fantastic Wieliczka Salt Mine, near the city of Kraków. A famed tourist attraction, a site of worship and even weddings, a gripping gallery of artistic reliefs, everything in Wieliczka is carved from salt blocks. 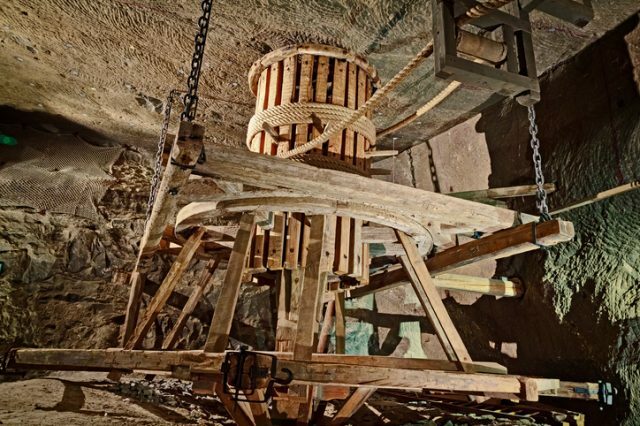 Mining operations stopped in 1996, but for many centuries in the past Wieliczka was the most significant cog in the local region’s economy. Salt was recognized as a precious resource in medieval times for its preservative properties, and this led to increased exploitation of it. Mines such as Wieliczka were worth gold. In fact, by Renaissance times, it seems there wasn’t any other more lucrative business in Europe than this mine. Royals regularly visited the venture, but it was miners who spent days and nights here, endlessly intruding the earth, creating new shafts and digging out new caves. But they also sought comfort. The story of the mine’s lavishness begins with the miners. Underground Saint Kinga Chapel, Wieliczka Salt Mine, Poland. 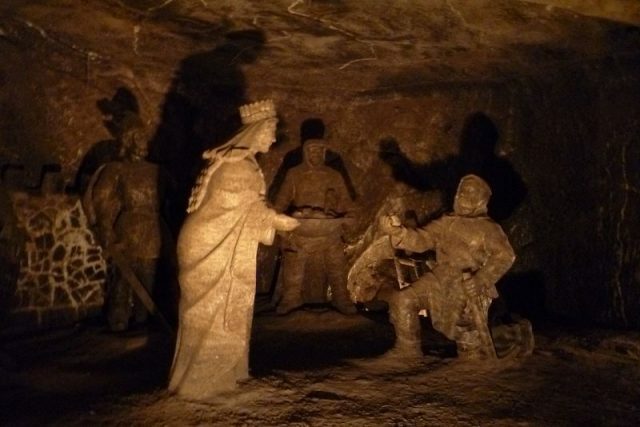 Sculptor-miners began adorning the caves with figures of salt ever since the 13th-century. This gave a breath of life to the place where they were supposed to spend all the sunny hours of the day. It’s hard to imagine the vastness of the place. It’s said Wieliczka today contains about 2,000 chambers which may take full two months to go around each and every one of them. Underground Michalowice Chamber, Wieliczka Salt Mine, Poland. The mines descend through nine levels. 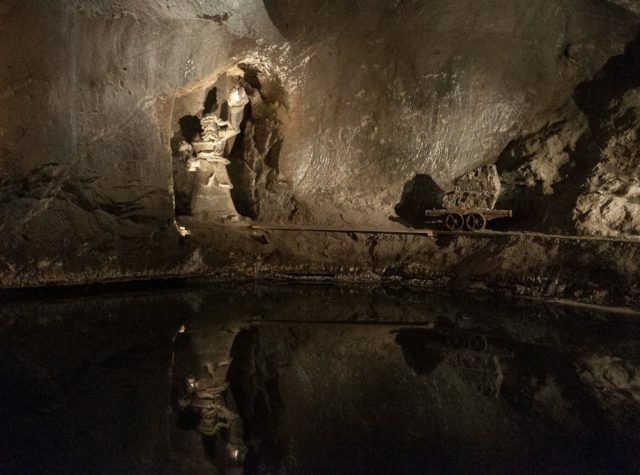 At its lowermost, the site reaches about 1,000 feet below the surface. 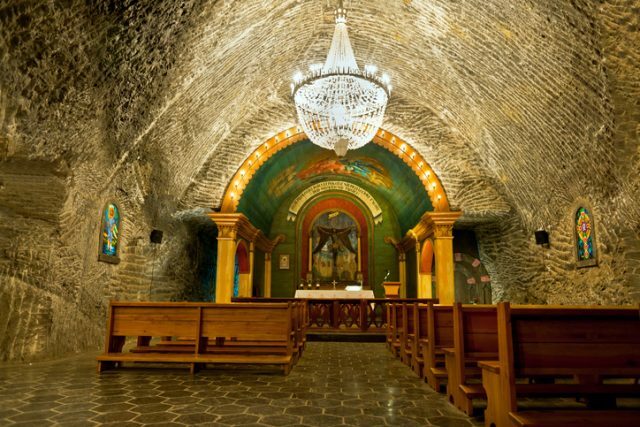 Over the centuries, the miners turned some of the chambers into chapels and embellished them with church iconography. 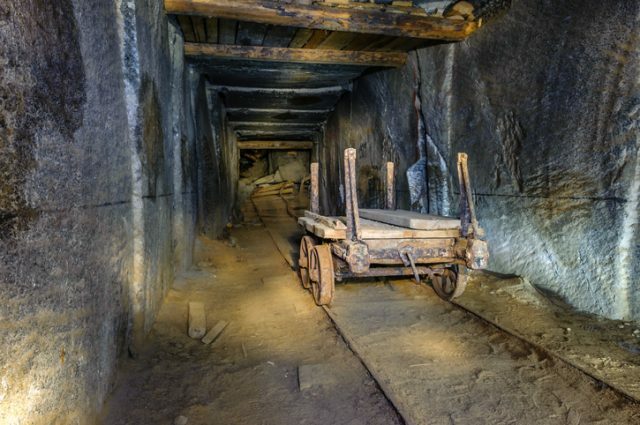 Underground corridor with wooden machine for pulling mine carts, Wieliczka Salt Mine, Poland. Altars were raised where workers could also pray and stay connected with God up in the heavens, even though they were so deep inside the earth. 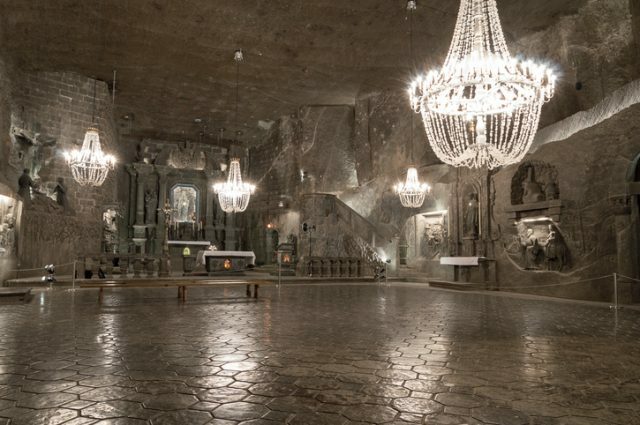 The site also wears the name Underground Salt Cathedral of Poland and is today both a National Historic Monument of the country and a protected UNESCO site. Its most famous chamber is undoubtedly the Chapel of St. Kinga, the most marvelous of all chapels. 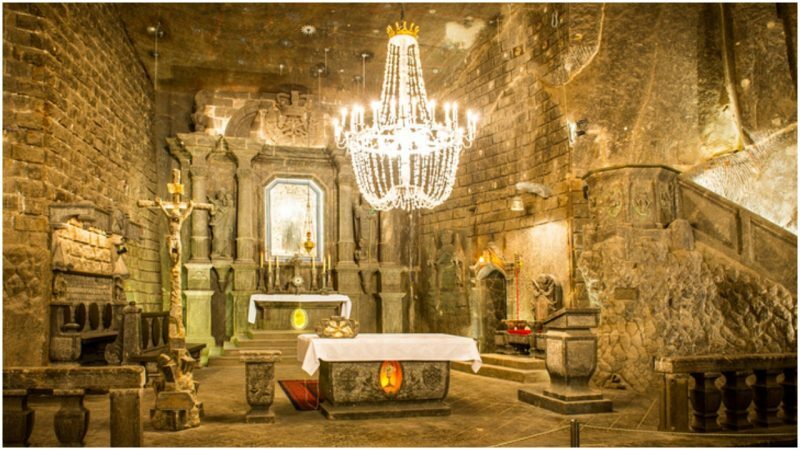 Nestled at roughly 330 feet below the surface, the Chapel of St. Kinga is among the largest underground church structures in the world. 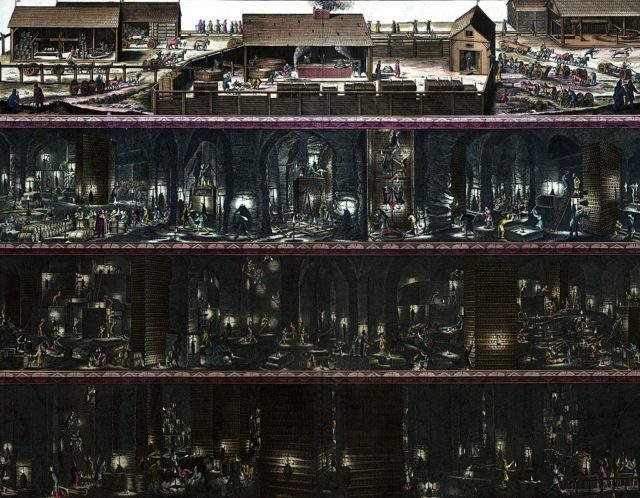 People also refer to it as the “crown jewel” of the Wieliczka mine. The chapel venerates St. Kinga, a patron saint of all salt miners and her relics are laid to rest here. St. Kinga’s figure relates to that of 13th-century Princess Kinga from Hungary who went on to be a Polish bride. She wedded the young Polish prince Bolesław the Pious. Legend has it, it was the new bride who brought salt from Hungary to Poland as part of her dowry. 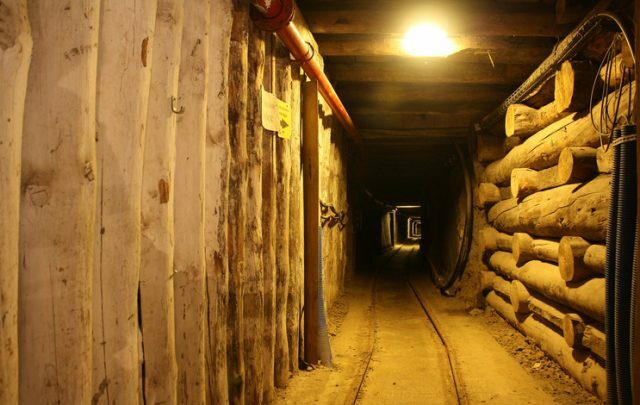 She first tossed her engagement ring in the mine shafts of Máramaros, then traveled to Krakow with a group of miners. 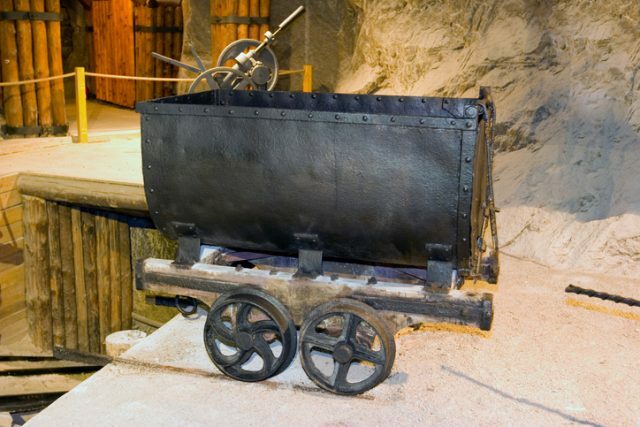 A mine cart at Wieliczka Salt Mine, Poland. Before reaching the foreign city, Princess Kinga asked the miners to start digging. They did so and suddenly stumbled upon something quite solid. then became the patron saint, keeping the salt miners safe and sound during their duties in the underground. 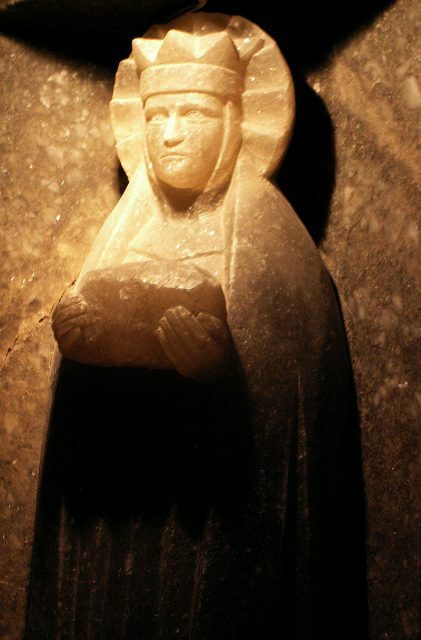 Her figure occupies a special place inside the Wieliczka St. Kinga chapel, which is otherwise entirely covered with prominent biblical reliefs. 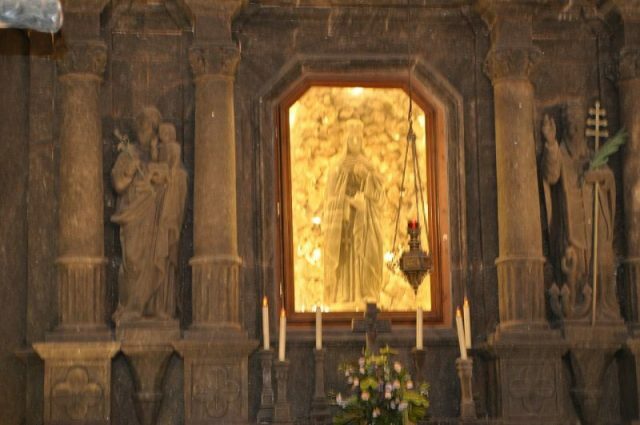 She is in the center of the chapel’s high altar, sculpted by Tomasz Markowski one of the three men who did most work in this sacred corner of the mines. Next to St. Kinga’s figure are also the figure carvings of St. Joseph and St. Clement. Lavish chandeliers made of salt crystals hang from the chamber’s ceiling and warmly lighten up the entire interior. Decades of work were needed to complete the St. Kinga chapel, which by the end of the 19th-century was found in a part of the mine that was still active. 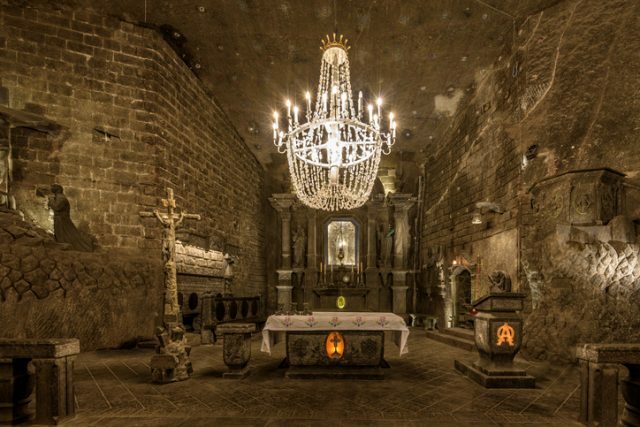 Saint John Chapel in Wieliczka Salt Mine, Poland. Much of the chapel’s furnishing was done by Antoni Wyrodek. His reliefs were mostly inspired by the New Testament. He was also inspired by Leonardo da Vinci’s Last Supper piece, so he carved his own version out of salt inside the chamber. Beautiful scenes by other artists inside St. Kinga chapel include the Nativity scene. In the chancel, four different types of salt consist the depiction of the papal cross which here stands as a symbol of Wieliczka, Bochnia, Sieroszowice, and Kłodawa–Poland’s four major salt mines. Chapel in the main hall of the Wieliczka Salt Mine. In 1999, a sculpture of Pope John Paul II was also added in this chapel. He is worshipped as the only Pope in Papal history whose origin is Polish. A Holy Mass is regularly held each Sunday at St. Kinga’s Chapel. The chamber is also used to carry out wedding ceremonies. Wieliczka salt mine, Kraków, Poland. Besides this chapel, plenty of other rooms at Wieliczka are in full flow today. Some of the saline chambers accommodate health facilities. There is one that can help people who struggle with chronic allergies. Other chambers are used by contemporary artists to display their works of art. Bars, restaurants, conference rooms, are also found in the area. Perhaps there are no more miners around, but life is greatly thriving in the depths of Wieliczka.